Chicken Pot Pie is one of my son's very favorite meals and he is also a bacon lover, so I knew he'd get a kick out of this combination. First, I precooked the bacon top crust. Preheat the oven to 400 degrees. 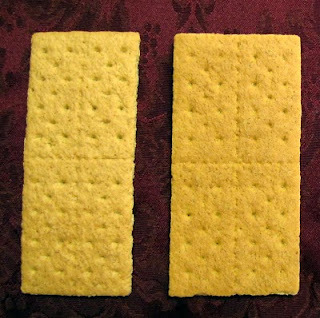 Place a piece of parchment or a Silpat on a cookie sheet. Form the raw bacon into a lattice by laying one strip across the top of the pan horizontally, then place a second strip vertically, overlapping the first at the top left edge. Continue adding strips, alternating horizontal and vertical strips and weaving them under and over each other until you have formed a square that will cover your pie pan. I used a whole package of bacon. I like thinly sliced bacon so it gets nice and crispy. Bake 15 to 20 minutes until the bacon is almost cooked to your liking. Remove pan to a cooling rack. Increase the oven temperature to 425 degrees. Invert your pie pan over the bacon and trim into a circle. 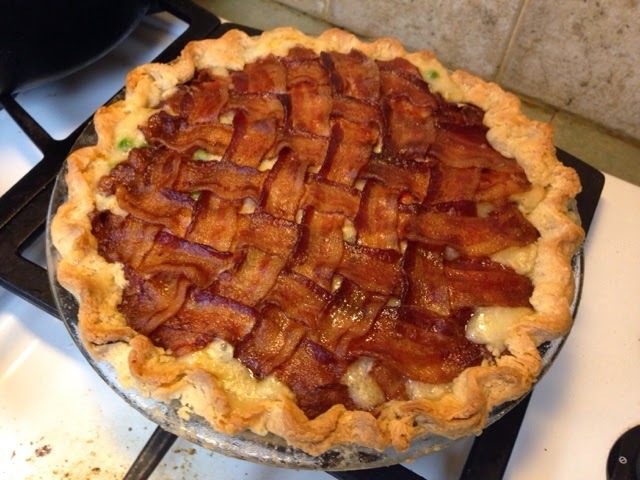 Allow the bacon to cool while you prepare the filling and bottom crust. I used my Classic Chicken Pot Pie recipe. (You can halve the pastry recipe or freeze the top crust to use later.) Line the pie pan with the bottom crust letting the pastry hang over the edges. Pour the filling into the crust. Place the circle of bacon over the filling. Trim the pastry to about 1 inch and roll it up to enclose the edges of the bacon. Crimp with your thumb to seal. Bake as directed in the recipe, 30-35 minutes, until the filling is bubbly and the bacon is crisp. Serve immediately.